I put on my ski pants weeks before I left for Colorado and just sat in my room…I was so stinkin’ excited! I had these visions of skiing down the snowy slopes like a pro. I was so ready to get up and go right then! Then the week before Spring Break, a funny thing happened. I got sick. Fever, congestion, mucus everywhere…you can imagine. I never get sick. By about Tuesday, my taste buds went out the window. My banana tasted like a nectarine and my turkey sandwich tasted like a ball of dough. By Wednesday, I couldn’t taste anything. Friday rolled around and I still had a slight fever. But by darn, I WAS GOING on this ski trip! So I drugged myself and got in the car for 16 hours and prayed for healing. Saturday morning I could taste again! Sunday morning I woke up and put on my long johns and danced around. It was FINALLY the day. The day I was going to fulfill my destiny to ski. Fast forward to the mountain. I clipped onto my skis and stood there waiting for my next instructions. I was told to make a pie shape with my skis and go down the hill to the lift. I did. And I knocked out two women. One of the women held up her wrist and exclaimed, “I can’t move it!” Awesome. My first three seconds and I disabled a woman. I stumbled my way to the lift and somehow made it off without falling. Then I was told to start going. I did. And the side of the mountain must have heard and started running towards me. Because after a few seconds, we were feet from each other. I bailed. Then I tried to stand up and I started skiing backwards. I bailed again. I couldn’t stand up and I was using every muscle I could find in my body. Fast forward to the lift round two. This time I fell off of it at the top. Then a few seconds after going down the hill, I was forced to either bail or go down the harder side of the mountain. I chose to bail…and hey, I was already good at it…it seemed like a good choice. Until I was on my stomach with my skis above my head. After I slowed down, I stopped myself and literally crawled to the easier side of the mountain. Luckily, I was skiing with my friend, Ashlee. And as I was crawling, she was skiing into the trees…then trying to get out of the trees. She ended up having to take her skis off and walk out of the trees. I was practically jumping for joy when she escaped. But then she couldn’t get her skis BACK ON her feet. I stood there trying to coach her: “Come on…you’ve got this, girl! Just push really hard! Harder! Almost there! Line your feet up…oh, to the right! Left! Almost!” After a few torturous minutes we were nearly in tears. Her left foot simply would not clip back into her ski. And so I led us in a prayer. I started out praying for Casey. Casey is Ashlee’s last name. But God knew who I was praying for all the same. And I took off my skis and crawled over to her feet. I figured out the problem and helped her clip back in! We were back in business! Almost. Now I had to get MY skis back on. And after a few minutes of what looked like a scene from I Love Lucy, I was back in business. We cautiously skied down and praised the Lord at the bottom. I called it quits for the day. Day two came and the mountain was really icy. A storm was brewing and set to hit at around three in the afternoon. I put on my skis, determined to conquer the mountain, icy or not. I tried to gently ski towards the lift and crashed into the orange netting and my right ski flew off of my foot. As I stood up, my body started shaking and I was sweating. I stood there for a while and then decided to sit and drink a glass of water for a few minutes. My upper body was still shaking the moment I started to move again. Then I learned I had altitude sickness. Hold up…I was supposed to become a great skier. At this rate, my dreams weren’t looking too good. Then a revelation hit me. I was like Matthew Barnett (founder of the LA Dream Center). He had dreams of becoming this great pastor for God. And he ended up shrinking a congregation of not very many people to zero. That was like me with skiing. “Molly, you can’t even BE in Colorado; the place makes you literally sick, much less, become a great skier.” Fortunately, God had much much bigger plans for Matthew’s life than being a success at pastoring. God told him to never think about being a success ever again. “I did not bring you here to build a great church. I brought you here to build people…If you reach the people that nobody wants, I’ll send you the people that everybody wants.” My failure at skiing reminded me of this awesome story. Thanks, Father. I needed that reminder. I can apply it to all of the things in my life I pin the label “failure” on. If this is eternity in the making, then I want to be like Mary. I don’t want to be a success at anything except sitting at Your feet. I don’t want to be good at anything else except hearing Your voice. I don’t want to be the best at anything except receiving Your best. I want to be like Joshua and obey. I want to claim what You say is mine. I want to be great only if You make me great in the sight of other people. Because this is indeed eternity in the making. Goodwill, to me, is like an easter egg hunt. And sometimes there’s the good stuff in the egg…and sometimes there’s nothing. But the hunt in itself, is fun, even if there’s nothing to be found. Today as I was in Goodwill, this thought hit me…I call it “goodwill logic” Don’t ask yourself, “Can I work this?” Instead ask yourself, “Do I WANT to work this?” This is helpful for a plethora of items you may encounter. I am confident you can rock anything you put your mind to. The choice is really up to you. 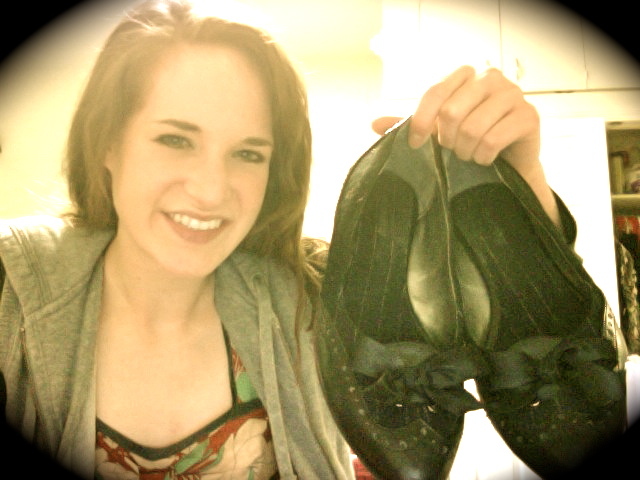 Pictured below is one of my favorite finds…black pointy toed flats. Note: with used shoes, it’s mind over matter. Don’t think about whose feet could have inhabited the shoes. Just get past it. Waffle House Rules: The first and certainly the most important rule is more of an understanding. It’s the understanding that not just anyone gets the priviledge to go to WaHo with you. Not everyone makes the cut. The second, only regulars, like myself, get to use the nickname “WaHo.” Moving on with rule #3: You only go with someone else before 10. 10 and later you’re allowed, but not limited, to go by yourself. Going by yourself before 10 says, “I’m lonely.” #4: You either dress up entirely too much, or you wear sweats. No middle ground business. And finally, rule #5: You must take at least 3 minutes of silence to observe your surroundings. Examples include: reading the rules posted on the wall, reading the menu of hashbrowns, counting mullets, and watching the orange juice as it circulates the juice. That covers it.